We previously discovered the wonder of making popsicles with just two ingredients, but if you're more of an ice cream person, here's a scoopable frozen dessert alternative that's nearly as easy. This no-cook, five-ingredient blackberry lemon ice cream comes courtesy of Food52's Posie Harwood, and it only requires two steps (neither of which involves cooking). The fussiest process in making ice cream is creating a custard base, because a proper custard requires careful technique. When making a traditional custard for ice cream, it is important to heat the egg yolks enough to thicken the custard, but they also tend to cook and curdle if they're too hot, and unless you want sweet scrambled eggs, you'll need to strain every bit of that out. I had never been in love with no-cook ice cream. I found it lacking in richness and in flavour. But this recipe changed my mind. 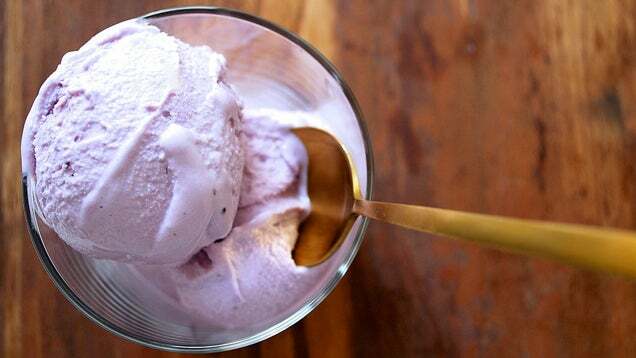 Two cups of puréed blackberries and a hefty dose of lemon juice give the ice cream a deep, intense flavour that balances out all the creaminess. Sounds like a must-try, especially as it's blackberry season. For the full recipe, head to the link below.